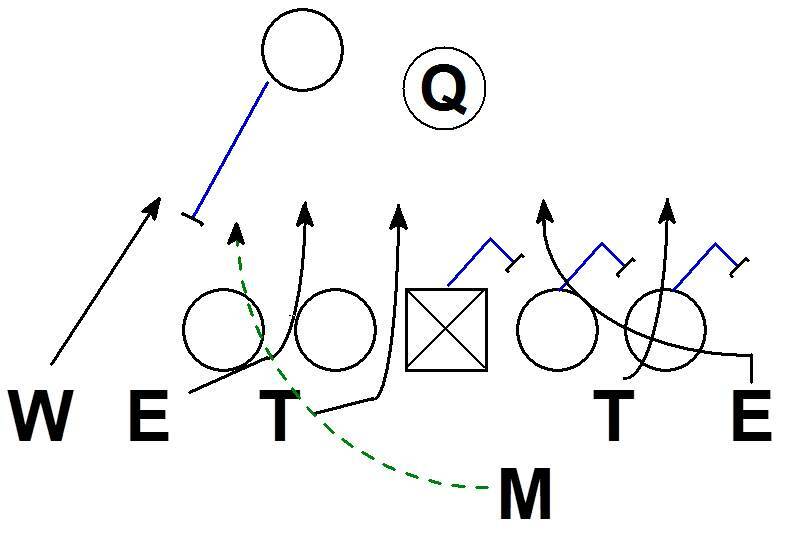 Here is a 5 man pressure green dog dialed up by Virginia Tech Defensive Coordinator Bud Foster. Cover 1 - man free coverage with a LB man on the RB. If the RB blocks the LB adds to the pass rush. The green dog technique by the LB creates a 2 on 1 vs. the RB and a clean run on the QB. 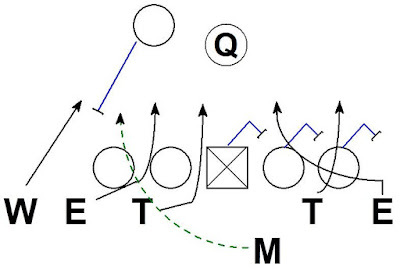 If the turn of the Center in protection is to the twist side of the pressure the offense cannot block the 4 rushers (Will, DE, DT, Mike) with the 3 blockers (Guard, Tackle, RB) to the defensive left. The offense does have a 3 on 2 vs. the twist and should be solid picking it up. What ends up happening is the Center sees the Mike's path and squeezes his pass set back to the pressure side. This creates two major problems for the protection. 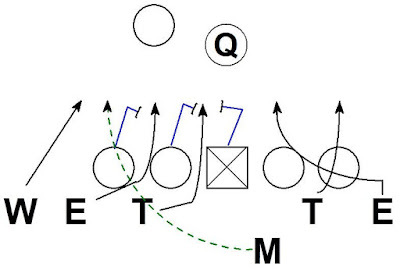 First, the Guard and Tackle would also need to squeeze back for the offense to pick up the Mike in protection. 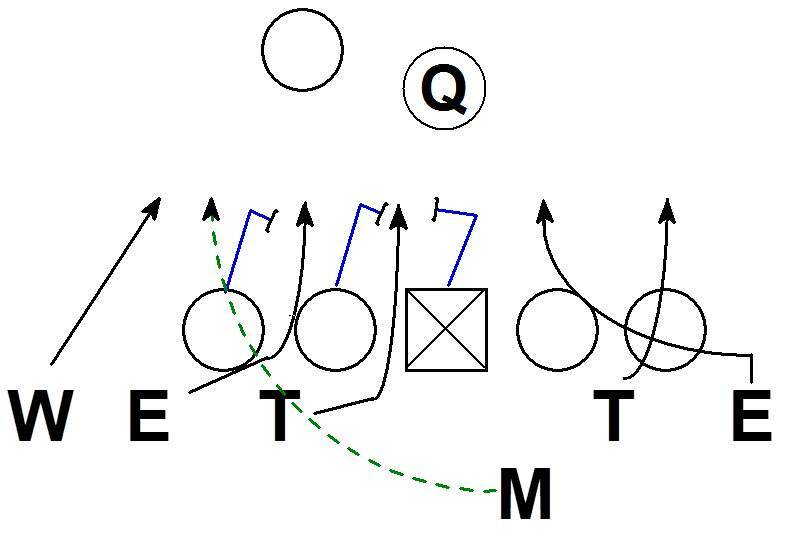 There is a low probability of the offense having the Center, Guard, Tackle all set one direction then identify, process, communicate and execute redirecting to block the rushers. The second problem is once the Center squeezed the protection back with the Mike, he created a 2 on 2 man blocking side against the twist. A Pass rush twist is highly effective against OL locked on in a man protection concept. Here the Center stays in the slide to the twist side. The defense has an easy 2 on 1 overload against the RB. This pressure is being adjusted based on the alignment of the RB. On the first clip #54 is the LB aligned to the wide field and the back, he edge rushes. 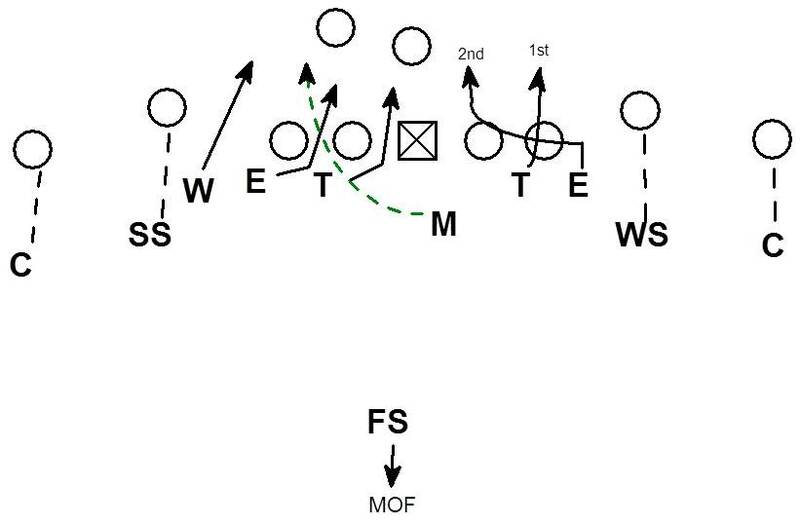 #40 is aligned to the short side & opposite the RB, he green dogs. 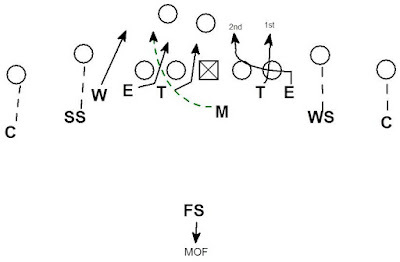 In the second example the RB is aligned to the short side. #40 is aligned to the short side and the back so he walks up a rushes off the edge. #54 is to the wide field and opposite the RB, he green dogs. In both examples the DL must also be aware of the RB alignment to know if they are pinching inside or twisting. Interesting and effective concept from the Hokies. From the single High look..is there a 2 deep pressure complement?